Figure 1) Batteries in series - The total voltage out is the sum of the voltage contribution of each cell. In this case 1.5 X 4 = 6V. The capacity remains the same as for one cell. Figure 2) Batteries in parallel - The capacity is extended four times that of a single cell. The voltage is the same as for one battery. I have scratch built a few working models and I wanted to know about hooking up batteries in series so as not to multiply the voltage. Is this possible? Something tells me it is possible, but the wiring eludes me. When talking about electric circuitry, the term series is referred to components being connected end-to-end, just like the beads on a string. When we're talking batteries (or cells in a more industrial meaning referring to rechargeable units) they are most commonly connected with it's positive (+) pole connected to the next cell's negative pole(-). This is illustrated in figure 1) above. Each cell has a set, constant voltage at full charge. When we need more voltage than that, you'll connect multiple cells in series. This is all typically determined by the load we're trying to power. In general, higher voltage brings more power (as in Wattage) to the load and at higher efficiency. So it is beneficial to run at a higher voltage for longer duration, whenever practical. One needs to be careful though, your motor and ESC can easily fry if fed too much voltage. Motors are typically pretty tolerant, especially if water cooled. ESCs fry easily and can burn from intermittent spikes even when calculated or measured voltage, when the model is stationary, is safe. So, leave yourself some margin. Batteries connected in parallel each have their positive (+) and negative (-) poles connected together as illustrated in figure 2) above. 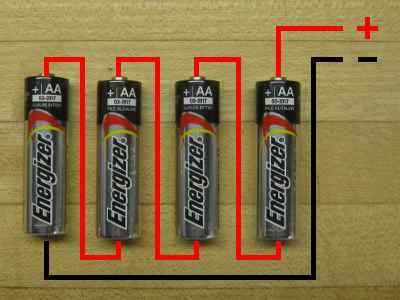 Connecting batteries in parallel keeps the voltage the same as a single cell, but increases the capacity of the bank of cells, or battery pack. Never connect different size cells in parallel, as in a 1200mAh with a 3000mAh for instance. Also, don't mix old and worn cells with new ones. Also, never mix different types of batteries in a circuit, such as Nicads with NiMHs. (Not to be confused with using different types for your radio and motor. They're technically separate circuits = OK). 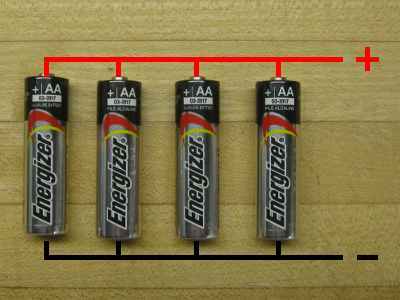 Most power sources for RC model boats use rechargeable battery packs, either Nicads, NiMH, LiPO, or Lead Acid. It is generally recommended not to connect these cells in parallel. The weakest cell in the circuit will limit the performance of the entire group. A better solution is to use cells with a higher capacity rating. Batteries can be combined in more ways than described if needed. Such a circuit typically beaks down into bans of cells in series and parallel. I don't see many applications in RC boat modelling to do this though. I've seen articles in old model boat magazines talking about reversing by switching on a separate bank of batteries and other odd circuitry. I believe most of this is outdated thinking by today's standard. Now we can get ESCs that cost less than a lunch in a sit-down restaurant. I can't see any reason not to take advantage and update those old designs whenever we encounter them.